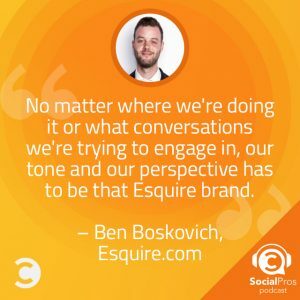 Ben Boskovich, Managing Editor for Esquire.com, joins the Social Pros Podcast to discuss how he maintains 80-year old brand consistency across the constantly evolving social media landscape. Having a known brand that has been around (and popular) for 80 years can present a marketer with some tricky situations in terms of brand representation. Add in evolving technology and social platforms and you have a recipe for a long-time-subscriber-alienating disaster. Ben has taken this challenge on and found ways to maintain the brand across mediums (both online and in print) while adjusting to the vastly different audiences that exist side-by-side on social media. For him and Esquire.com, it’s about keeping the brand consistent but reinterpreting it for each audience, depending on their age, perspective, and chosen medium. This sometimes means forgetting about click-throughs on Instagram and focusing solely on imagery. Or even connecting Snapchat Discoveries to 1,000+ word long-form content. By letting the audience lead the manifestation of the brand on each individual channel, he maintains control over the core brand values. The end result is a flexible yet consistent presence that adapts to the needs and desires of variable audiences. Be a social media junkie. Understand what it’s like to consume it on the other side and you’ll be that much better at being on this side of things. Also have a sense of empathy for how other people are going to react to things on social and always try to keep that in mind. But this all starts with really knowing how to use social on the consumer side and being active. Barack Obama. He seems like the coolest dude and Ben would love to Skype with him and talk about basketball. Jay: Welcome everybody to Social Pros, the podcast for real people doing real work in social media. I am as always Jay Baer from Convince and Convert joined again, once again, it's been a while, by my special Texas friend. He is the executive strategist for Salesforce Marketing Cloud. He hails from the great city of Austin, Texas by way of Tennessee. He is the one, the only, Mr. Adam Brown. Welcome my friend. Adam: Thank you. It's so great to hear your voice. Through the magic of audio podcasting we have seemed to be together every week for the past four weeks, but thank goodness to recording technologies we haven’t. We've been both on a little bit of rest bit from the podcasting world. Jay: We have. We've had some amazing guests though. Some of them we've recorded before vacations, some of them in the middle of vacations, and we are keeping the party rolling this week. Jay: I’m really excited about this show because our guest today is doing a bunch of interesting things on Snapchat, is doing a bunch of interesting things on Instagram, which I definitely want to talk about, and represents a brand that is very well known to big swaths of this country. He's got a lot on his plate and was recently promoted from Social Media Editor to Managing Editor, which is proof that people in social media can actually get ahead. He is now the big cheese at esquire.com. Please welcome Managing Editor, Ben Boskovich. Hello Ben. Ben: Hello, hello. Thanks for the warm welcome there. Jay: Hey man and congratulations for the promotion. That's really great. Ben: Thanks very much. I appreciate that. Jay: I mean I'm not kidding when I say that, to have one of our own, a social media person, now be in the managing editor and running the whole thing, that's pretty cool. Ben: Yeah, and I think it speaks to the role that social media has grown into in publishing, it's all important and we can get into that. But I was touching a whole lot of things because of my role in social media and it was kind of a seamless evolution into the role I have now which is kind of an interesting thing. Many years ago it might not have been that way. Jay: You were telling us off air that esquire.com, the digital property, and Esquire Magazine which is sort of where this all started are different business entities, different owners, different P&Ls, obviously you've got some other content and things like that, but you don't co-locate and you didn't really run them separately. Can you talk about sort of what implications that has for how you think about your role? Ben: Yeah, what you said is true, but to be honest it doesn't really change how I think about my role. Both the people that work on the print product and those of us on the .com side, we're here to represent the brand. You guys know as well as anybody and anybody that works in social specifically that brand, and you know in advertising as well which is where I came from, brand is the most important thing. The brand of Esquire reigns supreme over any business decisions or structures or any of that kind of stuff that exists out there. We're all working toward the same goal and representing Esquire as a brand out there on the web and in print. That's kind of our thinking. It's all about the brand, it's all about the Esquire lifestyle and the Esquire perspective. Whether you're reading that in the magazine every month or reading it in a tweet it's all coming from the same place. Jay: On the magazine side of course they monetize that attention through print advertising, through events, through subscription revenue. From your perspective, is the idea to use social to create engagement and that engagement eventually or consistently manifests in a visit back to esquire.com where you've got advertising some native, some regular, and that's how this all sort of makes sense financially? Ben: Yeah. Our goal is to build loyal readership obviously and people that want to come back to esquire.com and people that are glad that they are liking our page on Facebook and following us on Instagram. But we also are very and probably most interested in new visitors and a new audience. So we're always trying to find new ways to inject the Esquire brand into a new audience or a new group of people that are having a conversation about something that maybe traditionally Esquire hasn't spoken about but can have a perspective on in 2017. Jay: For example you just did something on Discover recently. I think it was about strange jobs. Is that what it was? Sort of unusual jobs that people might have and that was one of your Snapchat Discover stories? Ben: Yeah, that's our story actually that's live right now. We go live every Tuesday and it's a weekly edition. Or they used to be called editions. Now they're Snapchat Discover stories. So our current story is kind of a fun little feature on some of the strangest jobs out there in America. We've got stuff like professional sleep expert for one of the big hotels in New York, and a professional dog food taster, stuff like that. Jay: Is that person a person or a dog? Jay: Was that sold on your side or sold in the Snapchat side or together? Ben: I think that it's a partnership. I kind of stick to the editorial portion of it and I'm involved in the marketing part of it and sales in some way, and that, we'll build an editorial calendar of things that we think will be fun and interesting to our readership which is a challenge in and of itself because of how different the readership is on Snapchat on one end of the spectrum. Or the other end of the spectrum is probably the print magazine. Our Snapchat audience is 13 to mid 20s, which is very, very, very young and not traditionally the age of people that are reading Esquire. We're trying to come up with those ideas, and then our sales team also has that editorial calendar and is keeping that mind when clients come through and when those goals, when the clients goals and our editorial goals mesh perfectly, I mean that's harmony right there. We got that with this job; one which is performing extremely well, both for us editorially and I think for the client as well. Jay: For those kind of Discovery stories, they're rich. There's a lot of story telling and production value in those kind of pieces. From an editorial perspective what does that calendar look like? So how long ago did you start conceptualizing and working on that piece? Ben: … because that's engagement. It's not what we expected but it was something that I thought would be a cool story to tell that Esquire is tapping into its roots and telling long form journalism stories on Snapchat Discover, which didn't really exist at the time, and to our surprise it performed and it brought in a ton of new audience members, we got a ton of engagement, a lot of time spent, new subscribers. So that's probably my favorite thing about working on the platform, is that we're paying homage to our roots as Esquire but showcasing the brand in a whole new way that it's never been shown before via the platform. The constraints of the platform can be tough because of the 10 second limit or thinking that people aren't going to spend four minutes reading a story on their phone, and that's surprisingly not the case. The other side of the stone is sort of the more themed serviceable lifestyle oriented front of the book kind of stuff, if you will, that we’ll do. We'll do a guide to fitness that performs really well, or the best burgers in America, or the weirdest jobs in the country, stuff like that. That sort of does scratch that snackable itch. Those ones are I think the ones that are more attractive to advertisers as well because you do then get into these situations where Doubleshot and Esquire both had the same kind of idea of how they want this experience to live on Discover and that's good for business for sure. Jay: One of the things that is particularly interesting about your social strategy from an ecosystem perspective is that you do very different things in each social platform. We've talked about Snapchat. You've got a lot of content you're creating for Snapchat per se, whether it's re-imagination of magazine content or Snapchat native content. What you do there is what you do there and it isn't really related to anything you do in other places. Instagram, you've got a very, very active Instagram account, seven or eight posts a day in many cases, but maybe photos pulled from the magazine at some point or even archives, but they're not linking back to stories, things like that. Twitter alternatively does have links back to content on your site as does Facebook in many cases. So in some circumstances you're actively specifically saying click here to get somebody back to the site, but in a lot of other cases you're spending a tremendous amount of time and energy in social content in a way that doesn't necessarily sell the click, and I find that fascinating. Can you talk about that a little bit? Ben: Yeah, absolutely. I mean really what that comes down to is the audience. The audience is different on every platform. We have a Facebook audience, a Twitter audience, an Instagram audience, and a Snapchat audience that all are interested in different topics and taking different actions. Starting with our Instagram audience it's a little bit younger, it's a little bit more tapped into pop culture, so probably most similar to our Snapchat audience, but they also look to Esquire as a lifestyle hero or a lifestyle, an aspirational lifestyle guide. What I want to do there is sort of … Esquire has been around for 80 years and it's been kind of like the manual for men, and now men and women, which we have a huge female audience which excites me and I'm so happy about because we're not necessarily just a men's men magazine anymore. But I digress. They look to us for too, and we've inspired a lifestyle for 80 years, so I want our Instagram feed to sort of be a mood board for that lifestyle that we've been promoting all of these years. And what does that mean now? That means a little bit of news about the things that people care about, but in the form of photos because Instagram's a visual medium and some of our sister brands here actually have had some major successes, Cosmopolitan, Elle, Marie Claire, Harper’s Bazaar and driving traffic via Instagram. For us we found that our audience really is just more interested in beautiful imagery. Our sister sites have the best of both worlds because their audience is interested in beautiful imagery and they'll click through if they tell them to, which I think is gold. Our audience, they, unless it's big and breaking and we get it up on Instagram fast, they're not really going to click through, so I kind of hone in on the aesthetic and I try to keep a pretty consistent aesthetic on our feed. I've run the Instagram feed since I started as a social media editor and since moving into the managing editor role, I kind of hung onto it because I feel like it's my baby, and it's ever evolving and we're trying to do new things with it, and even I've experimented in taking some of our front of the book stuff from the magazine that doesn't necessarily warrant a post on the website, but has enough words in it, maybe it's like a 300 word write up in the front of the book about a watch, that we can make that sort of its own little story on Instagram and have it live in that ecosystem. On Facebook it's a completely different audience. It's much older. Politically they have different views than maybe our Twitter audience does, which is an interesting thing. But it's sort of like I would say our Facebook audiences probably consists of more people that grew up reading the magazine and they think of magazine more when they think of the brand, and they … Facebook's audience in general is a little bit older, so we get the residual effects of that. Not that we don't have young people, we're probably strongest in the 25 to 34 range, but that's pretty old for social media fairly surprisingly, so I guess I fall into that old range at 28. But they ..
Jay: I agree about the aesthetic on Instagram by the way. When I was looking at your accounts, right away you can tell that it's very curated to have a particular vibe across the board. It's really, really well done. I'm surprised though, and to follow up on this point I made earlier on the cadence, and you're doing seven or eight posts a day which is certainly more that we see from a lot of brands, and it must be working for you. Have you always been that active on Instagram, or did you sort of say, “Look, if one a day is working well let's try two, and if two is working well let's try three, and if three's working well let's try six”? Ben: It's kind of interesting how that's evolved. I mean Instagram has an algorithm now. Before it had an algorithm and everything was chronological it was easy that you could post as much as possible and that was going to help you grow because just based on the chronological order you were going to appear more times. I felt at the time as long as it was up to that standard that we were trying to adhere to that it didn't matter how many times we posted. Since the algorithm happened, we met with, we work with a company called Dash Hudson who kind of helps us with our analytics and the analysis of what's happening on our page, and they told us exactly what you said. “You guys are posting a lot more than your competitors even are.” Leaving out probably complex who we consider one of our I guess competitors, and they post an awful lot, definitely a lot more than we do, but they said, “You guys don't have to post that much anymore,” so I kind of, I've dialed it back since then which is helpful for my work flow. If six posts does as well as nine posts, then I'm going to go with six. There's no need to force more out there, and then that gives us more content to spread throughout the week. Growth has definitely slowed since the algorithm but we're still seeing really high engagement rates based on a relatively small audience at 305,000 compared to some other lifestyle brands out there. We have a little bit of a smaller audience, but our engagement rate is high. We have a loyal audience which I value very much. Adam: Ben, what I'm fascinated by is how you're kind of articulating kind of the ROI on the social activities that you have. I think most of Social Pros listeners are going to look at what they're doing and they're using content to drive interest in a product or a service and in some ways on its first glance you look at what you're doing with esquire.com and you're using content to drive interest to other content, which of course is where your advertising revenue comes from. What I'm fascinated by and I'm curious whether your agencies and analytic firms and your internal activities like the Dash Hudson that you mentioned are able to kind of articulate, “Okay, Ben, these activities are really helping us drive brand awareness in Esquire, and the property and of course esquire.com itself, and that these activities are actually driving eyeballs to places where you have advertising.” Do you look at things Ben through those two funnels or is it all kind of one and the same? Ben: No, you're absolutely right, I mean, and that's what I was getting at in the difference in the audience across platforms, is that Facebook and Twitter are our traffic driving platforms that that's where we see from a social perspective, leaving out search and other referral traffic aside, from a social standpoint Facebook and Twitter are always going to be our traffic drivers and unique visitors on the site are what our advertisers and what we are interested in. We're going to use those platforms to drive as much traffic as we can and peppering the brand building stuff to help complement it. Because in the Facebook environment sometimes it's not about getting people elsewhere, and in fact Facebook probably, Facebook rewards us when we keep people on the platform and go for engagement plays, but places like Snapchat is it’s own ecosystem, you're not linking out to anything else from there, so it just, it exists in and of itself. Sort of the same for Instagram for us where there are mechanisms where we can take people elsewhere, but where we see the most benefit in keeping people there and keeping people engaged it's a different group of people everywhere, so we have to fulfill their needs as our reader. They're all readers. They're just in different places talking about different things. Everything that we do I kind of think of Esquire and the brand as like this sphere and everything that we do has to pierce through that sphere. No matter where we're doing it or what conversations we're trying to engage in, our tone and our perspective has to pierce through that Esquire brand. It really doesn't matter what they're talking about or where they're talking about. As long as the way that we're engaging is on brand I'm happy. Adam: One of the things you mentioned a little bit earlier was, and I wrote it down because I thought it was such a great quote, Ben. You said that Esquire has been inspiring kind of lifestyle for 80 years. I mean 80 the Esquire brand has been around primarily with the magazine, but obviously that the success that you're having with esquire.com. Now there was another division of kind of the Esquire brand that hasn't quite had the success that you’ve had, and that was the cable network that I know I think shut down end of last month here in June. I'm curious. I was actually a big fan of that, especially some of the kind of first shown original programming for that, and as I heard about that, even before I knew Ben that you were going to be on our show, I began to realize, “You know, the whole world of cable and that content is changing. I wonder if because of the success of social, because of the success of sharing content, especially with younger viewers online may have had a detrimental effect to kind of traditional terrestrial cable.” Any thoughts on kind of the shift of that same content, that same storytelling, but now the success that you're having with .com and social may have actually impacted the other brands? Adam: I think it's a joint, was a joint partnership I think. Ben: Yeah, they purchased the branding to be able to do that. But in general in the as far as content consumption goes, you definitely see traditional means of viewing something or watching programming shifting to where the eyeballs are, the same way that Instagram was able to pop up and do a lot of the same things that Snapchat's doing and get away with it because Instagram existed a long time before Snapchat even existed so they had the audience, that's where the people are. They can do the same sorts of things and have great success because they have a huge user base. I think that you'll see that with social networks in general and the rise of streaming services. It's how do people want to consume it and where are they and how are they doing it. It's less and less through their cable box. I think that's where that shift comes from. Adam: Yeah, I think you just articulated it's fish where the fish are, and with cable cutters continuing to cut cable people aren't necessary going to cut cables to social, but it is that use of the right channel and the right social property, like you're investigating with Snapchat Discover. One question around Snapchat Discover and certainly the revenue models for all the things that we do as Social Pros in social typically have most of the revenue going back to the social platform. If Snapchat sells a pre roll or post roll, Facebook sells a pre roll, post roll, or a pop over, pop under on your social content, Facebook is making that revenue. You being the content provider and a publisher, do you see that revenue model changing that maybe in a year or two years when you maybe went to Snapchat like you did with the program, with the Doubleshot and coming up with a great perfectly matched content and advertiser, do you see them maybe looking at the revenue model of all this differently and actually having some revenue kind of going towards your organization in some sort of profit sharing? Ben: Yeah, and that's the way it works right now as far as I know. Like I said, with my journalist roots I try to stay as connected to the content and the editorial side as I can, but from what I understand it is that, it's exactly the situation we have going, is that it is a revenue share opportunity. They provide the space and we provide the goods and we reap the benefits together. Adam: It's a completely changing world I think in that regard too. Ben one last question before I hop it back over to Jay for some important speaking of the devil advertising messages. One of the things you talked about was kind of creating more snackable versions of content, and the surprise, and I'll say I was surprised as well at the idea that younger audiences were just as interested in that 10 second Snapchat pop, but then the 4,000 word story that appeared just behind it. Any other kind of interesting things that you're learning about younger audiences and content, thinking about our audience of Social Pros who are still also trying to find tricks and ways to position and package content so it's going to resonate the most with their audience, whether they're selling B2B widgets or they're selling new tents and sleeping bags for outdoor outfitter? Jay: Hey, wait a second. This is hitting a little close to home now. Adam: I got my AC DC shirt on right now. Are you talking to me? Jay: Yeah, it's like a George Clooney Daniel Craig kind of a thing. Ben: Yeah, so do you want George Clooney talking about fidget spinners and stuff like that with the kids? Jay: He could probably sell a fidget spinner. Ben: He's got new kids now too so he'll be learning all about that. Jay: Yeah, he's been the new target. Ben: But it's important for us not to come across like the adult in the room all the time in those kinds of situations. Jay: It's one of the country's greatest writers period. Ben: Yeah period. It's been a real journalistic pleasure of my life to get to share his words with people essentially. It's kind of interesting too because when I joined a little under two years ago, Charlie had this enigma of the internet in his blog that he would post a new blog and without social distribution it would, the traffic would shoot right up to the top of our site, because people camp and sit on his blog waiting for what he has to say about the relevant news of the day, which was insane to me. Like I walk into this, I'm in this industry where nothing exists until it exists on social. If you publish something that's on your homepage, only your very, very loyal audience that goes directly to your home page is going to see that. So until it's promoted on Facebook and Twitter nobody really knows about. That was not the case with Charlie and his content. He also had inactive social presence. He had maybe 30,000 Twitter followers but he wasn't tweeting that often. From time to time he would tweet but not links to his articles. We didn't have a Facebook page for him as our Esquire politics guy and so that was one of the first things that I set up when I got here. This guy has the golden goose of the media industry and this loyal audience. Let's get his Twitter going again. Let's get a Facebook page up for him. Now he has 100,000 followers and his Facebook page drives as much traffic on a post from his blog as our main page does. Ben: Yeah. So when he tweets something, it drives a lot more traffic than our initial tweet about it. That's been really, really awesome to have. That's a gift that I was given joining this team here. Jay: I do want to recognize our sponsors in a second, but I want to ask you one more question because we're on this topic. Obviously you get to hang with Charlie Pierce and you're his editor for digital content. Esquire as a brand runs in pretty, pretty sweet company. I mean it's a high end brand with a lot of credibility and deservedly so. So what is your best celebrity hang out story? Jay: You're the manager now, so give that managing under-title like you've given credit to other people, man, it's all working for you. Ben: One of my favorite things was probably hanging out. This wasn't at Esquire. I was at Entertainment Weekly Magazine before I came to Esquire and I got actually a lot more access to celebrities there than I do here. We used to go to Comic-Con every year, which is coming up I think next week and we would just ... Anybody who’s anybody that was at Comic-Con was in our suite and in our studio, and that was probably my favorite thing, is just getting to be up close and personal with all of them. They, the EW suite at Comic-Con was a thing that celebrities felt safe there. They did feel like they weren't going to get bombarded by fans or other journalists. They were just like part of the team there. It was all very casual and I got to talk to everybody, everybody that was at Comic-Con. I liked that a lot. Jay: Give me somebody who you thought was really, really cool in person that you thought maybe wouldn't be cool? Ben: Oh, that wouldn't be cool? Mike Tyson. Jay: Tends to have a lasting impact on your feelings for somebody. Ben: Yeah, that's deep inside there. You don't forget that. But he shook my hand, very firm handshake obviously, but was very kind and agreed to do whatever we wanted to do, which is, that's tough sometimes. These celebrities get shepherded through these events and they're kind of just like, “Do this, do that, do this,” and he was very gracious. Not everybody is so gracious. Jay: Ain't that the truth. Okay, so I already have the headline for this episode which is what Mike Tyson taught the managing editor of esquire.com about social media. Ben: That's a great headline. Jay: See how good that is? Yeah, I could work for you someday. But only if I keep making money on these sponsorships, and thank god we can. This week I want to acknowledge our friends at Salesforce Marketing Cloud who employ Mr. Adam Brown, the esteemed co-host of this program new e-book from Salesforce that I’d love for you to take a look at. It's called More Than Marketing, Exploring The Five Roles of The New Marketer. I think we all know that marketing's roles and responsibilities are growing and morphing inside organizations. So this new ebook is detailed information about the five new essential marketing skills that we all need to have. There's some cool interviews in there, stories, even interactive features to help you get started with expanding your role in your organization. Go to see candc.ly/newmarketer. That's candc.ly/newmarketer for that one from our friend at Salesforce. Also, super excited to let you know brand new ebook from yours truly Jay Baer called The Three Types of Social Media Metrics And Why They'll Get You Promoted. How incredibly relevant is that for today's guest Ben Boskovich who's just promoted to managing editor of esquire.com. God it's like I planned that. I didn't but I should have. I'm really, really proud of this ebook. It's the best thinking from my team, again, to get rid of myself, on the state of social media metrics, things you need to pay attention to, things that are frankly crappy and to worry about. candc.ly/3socialmetrics. That's the number three, candc.ly/3socialmetrics. Brand new for me. Give it a download, won't you? I'd be so happy if you did. Adam, back to you. Adam: Jay, thank you. Ben Boskovich, Managing Editor of esquire.com, it is so great to have you on the show. I was going to start this block out by asking you how and why you got promoted, but obviously it's because you downloaded Jay's new ebook. But seriously, and I know, and seriously, you have an amazing job, managing editor of esquire.com. You said I think since started at Esquire as a social media editor, you mentioned your experience at Entertainment Weekly and ew.com. Tell us the story about how you got to this position and your trips and trails through journalism, through digital, through marketing, and all of that. Adam: You preferred to be on the receiving end of those calls so. Ben: … restaurant. Yeah. That was pretty cool. Then I got to work on bigger accounts like Hormel Foods had a brand or has a brand called House of Tsang which is like these stir fry sauces that you use. We got to like come up with a big campaign and pitched them on a national level and I kind of helped drive through the social media strategy for that, and so I learned how to promote content on social and at the same time continued to consume content. It's like a news junkie and social media junkie. At some point my girlfriend and I both decided that we wanted to move to New York and it was where we both always wanted to be and we just had to do it so we jumped in. She actually got a job before I did. I moved to New York without a job but with a couple of real good contacts, one of them is a guy named Eric Goeres who had worked at Esquire previously actually, but he had been around at all the major publishing companies and had very good connections. I don't know why he decided to stay in touch with me and entertain my emails and stuff but he did. He's a great guy. I owe everything to him. He got a job at Entertainment Weekly doing I think his title was Director of Innovation, so he was just trying to do all kinds of new stuff on the digital side with them, and one of those things was building their first ever real social media team. EW didn't have a ... They had a social presence that was huge and loyal, but it wasn't serviced with very, like in a dedicated way where they had a social editor. So I did that for a while and I got to work with a guy named Chris Radcliffe who taught me everything I know about the publishing side of social media and what our job is. Our job is to drive traffic and it is to raise brand awareness and create a sense of loyalty from on the brand level. I didn't really understand that going into the publishing side of social. I thought it was just to get stuff out there and have people like it and comment on it. I learned everything there and then one day so an opening for a social media editor at Esquire, which when I was back and we’re all in Pittsburgh all I wanted to do is work at Esquire. I wanted to work at Esquire Magazine, maybe be the Editor In Chief some day, who knows, like I really wanted to work at Esquire on the magazine side. Little did I know I would end up getting an opportunity to something that I probably at that time never expected would even exist in being the social media editor for the website, and less than two years ago I got the role here and it's evolved obviously since then. But I kept thinking about what my mom told me way back when, “Don't ever pass up an opportunity to learn something new,” so I started taking on something else and something else, all these things that were outside of the job description of Social Media Editor and about in May I was able to leverage that into this promotion and this role, which I love and I'm exited to have, and I love the team that I work on, I work with, and the stories that we work on and our mission. It's always, it's been great. Its been a crazy ride that I couldn't have predicted any of it, but I'm where I always I wanted to be. Jay: Man super happy for you. That is an unbelievable story and congratulations for all your success. Can't wait to see where you take it next Ben. Adam: Great advice from your mom. Jay: Oh yeah, your mom needs to be on the show. I'm going to ask you well the two questions we've asked every single one of our guests here across six and a half years, whatever, we've been doing this show. First question is, what one tip would you give somebody who's looking to become a social pro? Ben: Get involved in social like be a Twitter junkie, be a Facebook, Instagram, Snapchat junkie. Understand what it's like to consume it on the other side and you'll be that much better at being on this side of things. I'm only good at social media because I've consumed it and I know how I consume it. I can not only interpret how I would react to things, but I try to have a sense of empathy for how other people are going to react at things and always try to keep that in mind. But it starts with really knowing how to use it on the consumer side and being active. Jay: That's a good tip. And last question for you Ben Boskovich, Managing Editor for esquire.com, if you could do a Skype call with any living person, who would it be and why? Even Mike Tyson. Ben: I'd call with any living person, oh my goodness. I'm going to say Barack Obama because I think that he is just the coolest dude and was a great president and he seems like the kind of guy that could only show how cool he really was in a political role, and I would love to Skype with him and just like talk about basketball. Jay: I love it. We'll see if we can work that out. Ben, thanks so much for being on the show. Really appreciate your wisdom and your time. Everybody spend some time of your own over on esquire.com. Check them out on Instagram. Ben still manages that account himself. It's really good. Obviously there's Snapchat Discover stories as well. Consume some of that content so Ben can get promoted again, all right? Ben: Thank you Adam. Thank you Jay. Really appreciate it guys. Jay: ... this has been Social Pros. We'll be back next week with more fantastic guests. If you hadn't had a chance and you haven't for a while, pop on over to iTunes or whatever, leave us a review. We'd sure be happy about that. If you don't subscribe to the show, please do that. Also consider our sister show Content Pros at contentpros.com. I'm Jay Baer, he's Adam Brown, and we'll see you next week.